We handle the planning and hosting of events for all occasions, from small gatherings to large scale events with hundreds of attendees. 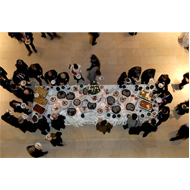 We specialize in international event catering for both personal and business purposes. We can also help with the promotion of these events and gather participants as well.